In 2010, the dream of Reem's was born at the doorstep of a street corner bakery in Beirut, Lebanon. The scent of za'atar, yeasted bread, and sweet orange blossom syrup right out of the oven and the sounds of laughter and chatter in Arabic all around me conjured up memories of my childhood and my yearning to create home and community in the United States. It was in watching the bread flying out of the oven, literally into hungry people's hands, and witnessing the life inside those bakery doors despite the political turbulence outside of them that I realized my people are masters of bread and hospitality: the lifeline of our history and what has kept us resilient over many generations despite colonization, war, drought, and famine in the Arab world. On a soul searching trip to Lebanon and Syria, I decided to bring this experience to the Bay. I wanted to bring more than just a bakery. I wanted to recreate the sights, sounds, tastes and aromas of the streets of Damascus and Beirut, and at the same time a space that feels familiar and inviting to all cultures. I wanted to create a sense of home. In 2015, we launched our business as a proud participant of La Cocina, a women's food business incubator program. Our one farmers' market location grew to many and soon enough, we were serving our bread and street food fare to hundreds of people a week. In the fall of 2016, I set my eyes on my dream location—literally a corner of a transit center in the heart of the Fruitvale in one of the most diverse communities in Oakland. We entered and won the national OpenTable contest to fund our dream restaurant. Six months later, we opened our first brick & mortar location. Thank you all who have joined us on the journey towards our vision to build strong resilient community through the gift of Arab hospitality! Reem's is an Arab street corner bakery that connects people across cultures and experiences through the warmth of bread and hospitality. We believe in the power of food to build strong resilient community. Our vision is to be an anchor space that provides good jobs, delicious, nourishing food, and a home to many. Reem’s offers the warmth of Arab hospitality through the discovery of flavors, aromas, and techniques of the modern Arab street corner bakery. Community Building: We see our food as a medium for building community across cultures, generations, and experiences. Social Justice::We have a role to play in providing opportunities to marginalized communities through hiring locally, providing living wages, building leadership in workers and offering our space and resources to those who are working to empower their communities. Sustainability: We want to create a thriving local ecosystem by hiring and sourcing locally, minimizing our carbon footprint, and partnering with other local businesses that are aligned with our vision and values. Reem Assil founded Reem’s with a passion for the flavors of Arab street-corner bakeries and the vibrant communities where they’re located. Growing up in a Palestinian-Syrian household, Reem was surrounded by the aromas and tastes of food from the homeland and the connections they evoked of her heritage, family, and community. Before dedicating herself to a culinary career, Reem worked for a decade as a community and labor organizer, and brings the warmth of community to all her events. 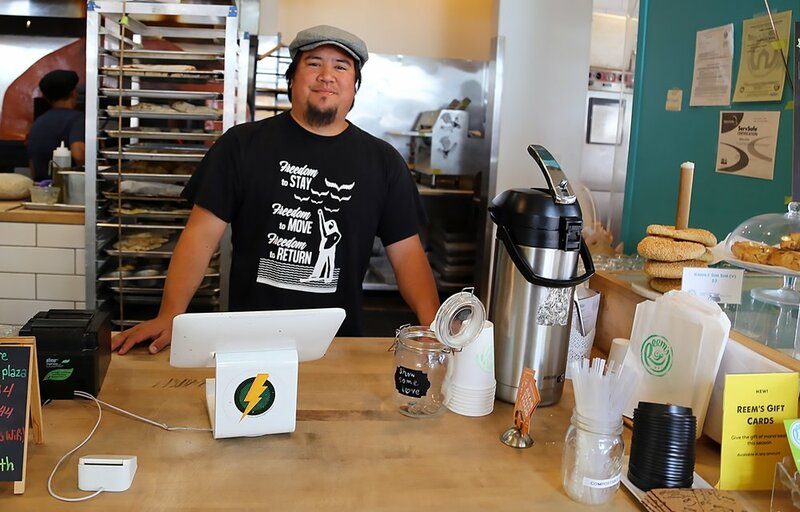 She has worked with the Bay Area’s esteemed cooperative bakery Arizmendi Bakery & Pizzeria, Grace Street Catering, Local Flavors, and several local chefs. She is a graduate of the the competitive food business incubator program, La Cocina. and business accelerator program ICA: Fund Good Jobs. Reem was a 2018 James Beard Semi-Finalist for Best Chef West, San Francisco Magazine's 2018 Chef of the Year and San Francisco Chronicle's 2017 Rising Star Chef. 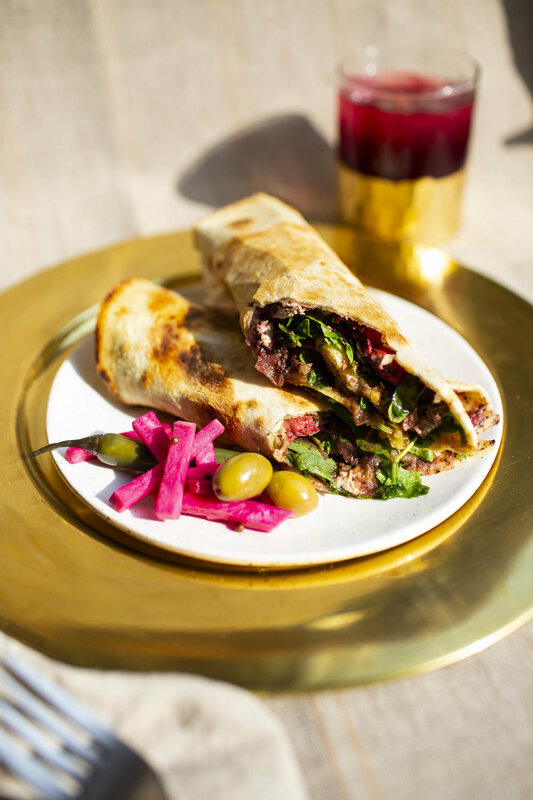 In 2018, she opened Dyafa, in collaboration with Daniel Patterson's Alta Group, a full service restaurant celebrating Arab hospitality inspired by her Palestinian Syrian upbringing. Rasmea Odeh wearing a button commemorating Oscar Grant. leadership development to hundreds of immigrant women. vocal about Palestinian human rights, the US government targeted and arrested Rasmea in 2013 for a fabricated immigration violation. .Despite international protests, Rasmea was deported in 2017. BART police in 2009 at the Fruitvale BART station, just above Reem’s. by Zionists seeking to silence anyone who speaks up for Palestine. In Rasmea’s spirit, Reem’s remains resilient and committed to social justice. continue to struggle for the well-being of all our communities.